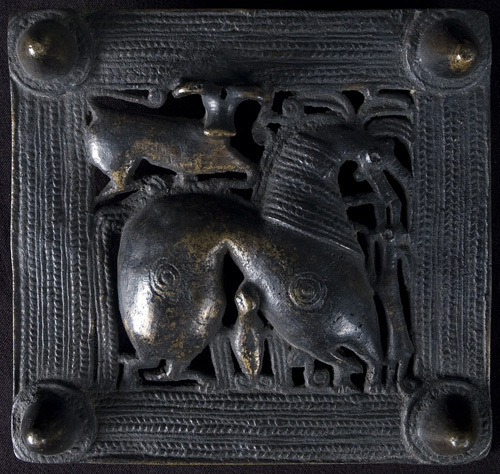 Several animals crowd into the small central space of this ornamental belt buckle. The animals all represent creatures that the Caucasian people encountered daily, but the arrangement and interactions suggest a mythical or fantastic meaning. The grained pattern and large nail studs in the corners give the illusion of this plaque being framed in wood and nailed to a larger support. A curly-horned goat rests on the horse's back, its tail flipped up over its head. A horse with greatly exaggerated, possibly tattooed, haunches stands facing right. Its mane and tail feature a braided or coiled pattern. The horse's thick arched neck supports a tiny head and a flowing mane. A small dog stands on its hind legs to reach up to the horse's nose. A large bird, facing forward with relaxed wings, shelters under the body of the horse.